Nothing like taking on bandits in what was a convenience store. A complaint I had with Metal Gear Solid 3 and 4 was that while the gunplay was smoother, it came at a cost of making it perhaps a little too easy to fight your way out of the Alert phase, and thus not really encouraging stealthy play like the earlier games did. I did a bit of Black Friday shopping on Amazon and finally managed to get my hands on some of the hottest games of this year, The Last of Us for PS3 being one of them. As Joel, you embark on a dangerous journey across the United States with Ellie in tow one day after a pandemic has turned a large part of the population into mindless zombies. In general, I haven’t really been keeping up with video game news as much as I used to, so I didn’t really know what to expect when I started playing The Last of Us. The game’s prologue actually led me into thinking it would be a Heavy Rain-esque adventure game, but it turned into a stealth action-adventure game after that. 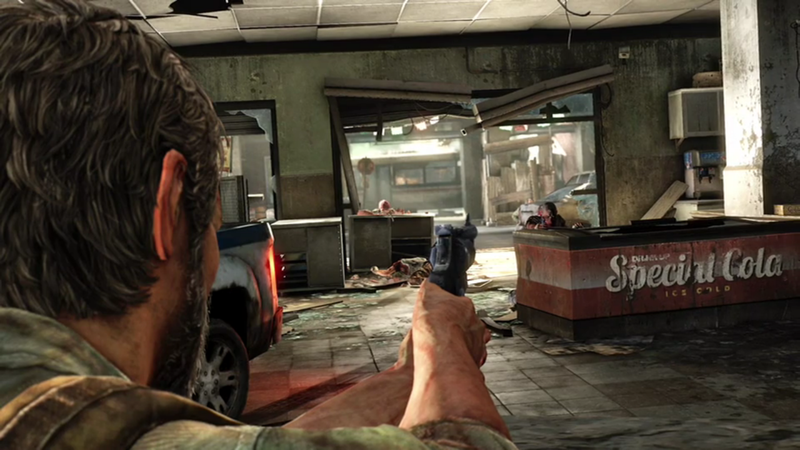 Most of the game sees you crawling through post-apocalyptic versions of various American locales, attempting to sneak past infected humans, as well as non-infected people trying to kill you. The Last of Us does really do a good job of driving home a survivalist instinct as literally everything in your path is trying to kill you, and ammunition is very scarce until the last part of the game. It’s by doing that and making the guns just a tad unwieldy, and thus making it more likely that you would make a really costly miss, the game really forces you to be stealthy. The stealth gameplay is good for the most part. Joel can sneak up behind someone and grab him when prompted, and he can either strangle the poor fool or use a very fragile shiv to quickly (and quietly) slit his throat. He can also throw bottles and bricks to create distractions for the enemies that appear to have hypersensitive hearing, or if need be, throw them right at the enemies to temporarily stun them. It’s almost enough to make Solid Snake jealous. Overall, the stealth mechanic took me a little while to get used to, particularly in an early area when you’re going down an abandoned office building, and that’s partly due to the limitations of enemy AI. One thing that didn’t happen in Metal Gear Solid but happened here was that as soon as you alert one person, literally every enemy in the area miraculously knows exactly where you are; as I said before, enemies seem to have hypersensitive hearing. At the same time, there were times I would stealthily kill a dude and see his buddy walk right by this guy’s corpse and not bat an eye at it. I guess that is to make up for the fact that you can’t pick up and hide bodies like you can in other stealth games. The level design tended to feel linear at times, but natural at the same time. To break the pace up, every so often, the game throws some light puzzle solving at you. Generally speaking, the puzzles aren’t too tough and don’t feel artificially forced in. A typical Legend of Zelda puzzle is significantly harder than anything in The Last of Us. From a gameplay perspective, Ellie could very well have turned into Resident Evil 4’s Ashley Graham, just waiting to get killed and causing you to fail your mission. Thankfully though, Ellie is perfectly able to fend for herself, even finding helpful things like medkits and ammunition for you to use. What I really need to say is that The Last of Us is easily the most cinematic game I’ve played in a while. It is extremely story-driven, where the focus is the growing relationship between Joel, a man who has basically lost everything dear to him in this pandemic, and Ellie, a girl who never knew of a world before the infection. A lot of my immersion resulted from the really top-notch voice-acting the game featured. Troy Baker already established himself as a terrific voice-actor to me in his portrayal of Sgt. Matt Baker in the Brothers in Arms games, and somehow managed to top that performance as Joel in The Last of Us. That combined with some of the most realistic facial expressions I have seen, and you have a game which I have little trouble holding to the same standard as movies as a storytelling medium. The graphics in general are very good. Little touches like seeing Joel’s wet clothes after he climbed out of a river he swam across added that much more to the credibility of the game world. The textures all looked good and the game ran without any slowdown in the framerate. Overall, if I had to compare The Last of Us to another game, what most easily comes to mind is last year’s Dishonored. Between the two, I feel like I’m more likely to recommend The Last of Us purely because the latter felt more immersive. The story in Dishonored almost felt like an afterthought and also felt a tad repetitive, which I felt like The Last of Us did a good job avoiding. However, both games had their strengths. Dishonored is probably a better game to go for if you’re simply looking for a straight up stealth action game, but to me The Last of Us had a little more emotional appeal.